علی یاس, زینب. (1397). ارزیابی مؤلفه‌های کیفیت محیط بر میزان حضور مردم در پارک‌ها (مطالعه‌ی موردی: 5 پارک در مقیاس‌های مختلف در شهر بندرعباس). فصلنامه جغرافیا ( برنامه ریزی منطقه ای), 31(1), 249-258. زینب علی یاس. "ارزیابی مؤلفه‌های کیفیت محیط بر میزان حضور مردم در پارک‌ها (مطالعه‌ی موردی: 5 پارک در مقیاس‌های مختلف در شهر بندرعباس)". فصلنامه جغرافیا ( برنامه ریزی منطقه ای), 31, 1, 1397, 249-258. 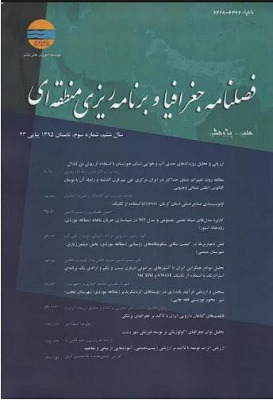 علی یاس, زینب. (1397). 'ارزیابی مؤلفه‌های کیفیت محیط بر میزان حضور مردم در پارک‌ها (مطالعه‌ی موردی: 5 پارک در مقیاس‌های مختلف در شهر بندرعباس)', فصلنامه جغرافیا ( برنامه ریزی منطقه ای), 31(1), pp. 249-258. علی یاس, زینب. ارزیابی مؤلفه‌های کیفیت محیط بر میزان حضور مردم در پارک‌ها (مطالعه‌ی موردی: 5 پارک در مقیاس‌های مختلف در شهر بندرعباس). فصلنامه جغرافیا ( برنامه ریزی منطقه ای), 1397; 31(1): 249-258. پارک‌ها بعنوان نقاط مهمی در شهر که نقش مهمی در ایجاد فرصت برای انجام فعالیت‌های تفریحی دارند و بعنوان فضای گردهمایی در محلات شناخته می‌شود که بر توسعه‌ی اقتصادی شهر تأثیر می‌گذارند. این تحقیق به بررسی و ارزیابی ویژگی‌های فیزیکی پارک که شامل راحتی، امنیت، دسترسی، زیبایی و امکانات می‌باشد و ارتباط آن با میزان حضور مردم می‌پردازد. 5 پارک در مقیاس‌های مختلف همسایگی، محله، بین محله، منطقه و شهری در منطقه یک بندرعباس بعنوان نمونه انتخاب شد و با طرح پرسشنامه دیدگاه مردم در ارتباط با این 5 مؤلفه و میزان دفعات حضور مردم در پارک‌ها نیز مورد بررسی قرار گرفت. جامعه آماری تحقیق حداقل 384 نفر در نظر گرفته شد که به منظور از بین بردن اثر مقادیر بیپاسخ احتمالی 450 نمونه بطور مساوی بین 5 پارک توزیع شد و با استفاده از نرم افزار Smart-PLS ارتباط این ویژگی‌های فیزیکی پارک و میزان حضور مردم در پارک‌ها سنجیده شد. یافته‌های پژوهش نشان داد ارتباط معناداری بین امنیت، زیبایی و دسترسی با تعداد دفعات حضور مردم در فضاهای سبز وجود دارد و ارتباط معنا داری بین امکانات و راحتی پارک‌ها با حضور مردم دیده نشد. با این حال، این پژوهش پیشنهاد می‌دهد ارتقا کیفی یک یا دو ویژگی نمی‌تواند به افزایش حضور مردم در پارک‌ها کمک کند، توجه به تمام ویژگی‌ها می‌تواند به افزایش حضور مردم در فضاهای سبز منجر شود. Public parks have central roles in urban planning and urban health. However, recently, in developing countries they have started to lose their significance due to fast redevelopment in these countries. The study explores the role of park features including aesthetics, facility and amenity, access, safety and comfort in related to park utilization. Five parks in different scales including pocket park, neighborhood park, community park, regional park and urban park from zone one in Bandar Abbas city were selected as samples of the study. The study used questionnaire survey to determine the relationship between park features and its utilization. 540 questionnaire were distributed in studied parks equally and finally 391 questionnaires were qualified to be used for the study. The study used Smart-PLS to evaluate the relationship between park features and its utilization. The findings showed the significant relationship between safety, aesthetics and access with park utilization. The study didn’t find any significant relationship between facility and amenity, and comfort with park utilization. Moreover, it was revealed that most of the participants don’t use parks frequently. Majority of them used the park once a week or less. Although the study didn’t find the significant relationship between some park features and its utilization but the study suggests that to promote people to use more public parks, increasing the quality of one or two features would not increase the general quality of parks and park utilization. In this regards, it is suggested, to increase park utilization, designers should consider all features of parks. مجنونیان، هنریک (1385). مباحثی پیرامون پارک ها، فضای سبز و تفرجگاه ها، سازمان پارک ها و فضای سبز شهر تهران. Bahmanpour, H., Rabori, A. A., & Gholami, M. (2013). The Qualitative and Quantitative Evaluation of Urban Parks and Green spaces in City of Tehran, 7(11), 3474–3480. Chin, W. (1998). Issues and opinion on structural equation modeling. MIS Quarterly, 22(1). Coen, S., & Ross, N. (2006). Exploring the Material Basis for Health: Characteristics of parks in Montreal Neighborhoods with Contrasting Health Outcomes. Health & Place, (12). Giles-Corti, B., Donovan, R., & Holman, C. (1996). Factors Influencing the Use of Physical Activity Facilities: Results From Qualitative Research. Health Promotion Journal Australia, 6. Goodmann, W. (1968). Principles and Practice of Urban Planning. Washington: International City Manager’s Association. Kaczynski, A., & Henderson, K. (2007). Environmental Correlates of Physical Activity: A Review of Evidence about Parks and Recreation. Leisure Sciences, 4(29). Lachowycz, K., & Jones, A. (2011). Greenspace and obesity: a systematic review of the evidence. International Association for the Study of Obesity, 12, 183–189. Lloyd, K., Burden, J., & Kieva, J. (2008). Young girls and urban parks: planning for transition through adolescence. Journal of Park and Recreation Administration, 26, 21–38. Miles, R. (2008). Neighborhood Disorder, Perceived Safety, and Readiness to Encourage Use of Local Playgrounds. American Journal of Preventive Medicine, 34. Mowen, A. ., Payne, L. ., & Scot, D. (2005). Change and Stability in Park Visitation Constraints Revisited. Leisure Sciences, (27). Razmkhah, R., Hanif, N., & Dali, M. (2009). The Impact of Parks on Sustainable Urban Living : a Survey on Park Use in Tehran. Sustainable Architecture and Urban Development, 331–338. Talen, E. (2000). Measuring the public realm: a preliminary assessment of the link between public space and sense of community. Journal of Architectural and Planning Research, 17(4), 344–359. Tinsley, H., Tinsley, D., & Croskeys, C. (2002). Park usage, social milieu and psychosocial benefits of park use reported by older urban park users from four ethnic groups. Leisure Sci, 24. Veitch, J., Bagley, S., Ball, S., & Salmon, J. (2006). Where do children usually play? A qualitative study of parents’ perceptions of influences on children’s active free-play. Health and Place, 12, 383–393.